Many consumers favor one-piece toilets because they tend to have sleek, continuous designs without crevices and joints that can harbor dirt and bacteria. Fortunately, all of the leading manufacturers offer a range of single-construction designs. There are also good combinations of features available, offering something for everyone. We reviewed some of the top one-piece toilets across a range of price points to help you make the right choice for your home. This toilet boasts double cyclone flushing, which eliminates the need for holes under the rim and replaces them with two nozzles. This product boasts the commercial grade G-Max flushing system, which is an industry benchmark. This is one of Kohler’s famous Comfort Height units. At the same height as a standard chair, it is more comfortable to use. The flush system is hands-free. This toilet includes a washlet, which sports an aerated water spray with pulsating and oscillating features and adjustable temperatures. The flushing system boasts the biggest flush valve and trapway in the industry. It can move 70% more waste than industry standards. The four-inch accelerator flush valve allows the water to enter the bowl faster than any other toilet, preventing dirt and streaking. At the top of the price range, this toilet is a single-construction, high-profile unit with an elongated bowl. It has a chrome-plated, side-mounted trip lever. The toilet has a wide basin and large splash back, and the universal height of 17.25 inches with the seat is comfortable for users of all sizes. The ceramic bowl and tank are finished in Toto’s patented SanaGloss glaze. This ionized barrier repels particles, bacteria and mold. The high-gloss finish requires less cleaning and chemical products. It also ensures that the toilet does not lose its color or shine. This toilet boasts double cyclone flushing, which eliminates the need for holes under the rim and replaces them with two nozzles. These create centrifugal force, cleaning the bowl perfectly every time. The result is a quiet but powerful flush using only 1.28 gallons per flush (GPF). Removing the holes from the rim improves the appearance of the toilet and makes it easier to clean. The SoftClose seat, which is included, has been specially designed to prevent the seat and toilet lid from slamming. It has unique soft-close hinges that gently lower the seat and lid. The toilet seat has been ergonomically designed to offer maximum comfort. It is molded from high-impact polypropylene, a glossy plastic that can withstand chemical cleaners. This product has a five-year manufacturer’s warranty. In the middle of the price range, this high-profile, one-piece toilet has a modern design. It has a chrome-plated trip lever and an elongated bowl. It is available in cotton white. The toilet has a large water surface, which helps to dispel odors. The toilet is finished with Toto’s proprietary SanaGloss finish. This ionized barrier repels particles, bacteria and mold resulting in less need for chemical cleaners and ensuring that the finish remains shiny and bright for years. This product boasts the commercial grade G-Max flushing system, which is an industry benchmark. The three-inch flush valve and computer-designed, fully glazed trapway along with siphon jet flushing action forces water into the bowl faster than other flushing system and then siphons it out with more force resulting in a spotless surface. This low consumption flush system, using only 1.6 GPF, is both quiet and powerful. The SoftClose seat, which is included, has been specially designed to prevent the lid from slamming. The hinges on the seat and lid have been specially designed to close gently every time. The seat is ergonomically designed for maximum comfort and is molded from high impact polypropylene, which can withstand chemical cleaners. This product has a five-year limited warranty. This modern looking single piece toilet has been designed with fewer creases and seams to make for easier cleaning. It is available in a wide variety of colors that should fit in with any color scheme. The bowl, although elongated, is compact, taking up the same amount of space as a round bowl. The toilet has been designed to fit into small spaces. This is one of Kohler’s famous Comfort Height units. At the same height as a standard chair, it is more comfortable to use. The AquaPiston flush allows water to flow 360 degrees around the bowl, creating a fast flush that is water efficient using just 1.28 GPF. The seat and lid are included with the toilet, but the supply line is not. This product has a one-year limited warranty. This toilet is at the top of the price range, but it does include everything that the homeowner could imagine and a lot more. It is a one-piece unit with a skirted design and an elongated bowl. It is ADA approved. The bowl is protected both inside and out by Toto’s patented SanaGloss finish. This ionized glaze repels particles, bacteria and mold, resulting in less chemical cleaning products to clean the bowl, and ensuring that the finish retains its original beauty for years. This toilet supports Cyclone siphon jet flushing. This very high-efficiency flush uses between 0.8 and 1 GPF. The toilet automatically senses the size of the flush required. The flush system is hands-free. This toilet includes a washlet, which sports an aerated water spray with pulsating and oscillating features and adjustable temperatures. A remote control operates this Wonderwave spray and warm air dryer. The automatic open and close functions of the lid and seat can be operated by either remote control or sensor. The toilet also boasts an automatic deodorizer and a nightlight. Electrolyzed water technology breaks down bacteria. A temperature-controlled SoftClose seat is included. This product has a three-year limited warranty for residential use and a one-year warranty for commercially used toilets. This elongated one-piece toilet is at the high end of the mid-price range. It is available in bone, linen and white. The vitreous china bowl is finished with an EverClean glaze, which hinders the growth of mildew, mold and bacteria that cause odors and discoloration. This high-gloss glaze helps to keep the toilet shiny and looking great for years to come. 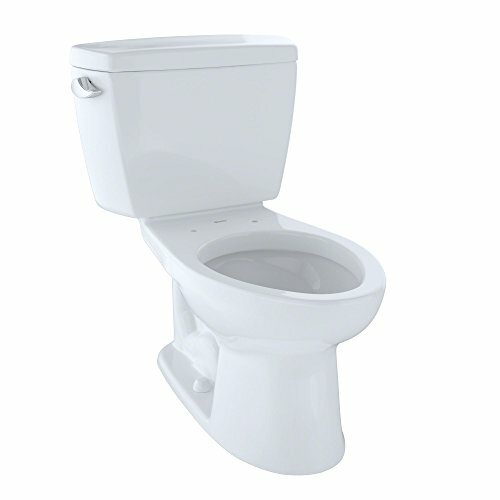 This is a Right Height toilet, which is the same height as a standard chair meaning that the toilet is more comfortable. It is ADA approved. The flushing system boasts the biggest flush valve and trapway in the industry. It can move 70% more waste than industry standards. An independent maximum performance test proved that this system can move 1000 grams of waste. The system is capable of forcing water 360 degrees around the bowl in less than a second, using 1.6 GPF. The seat is not included, but two color-matched bolts are. This product has a generous ten-year warranty. In the middle of the price range, this elongated one-piece toilet is available in bone. The vitreous china bowl and tank are finished inside and out with EverClean glaze. This high-gloss finish prevents the build-up of bacteria, mold and mildew, which can cause odors and discoloration. This finish ensures that the toilet retains its good looks into the future. The Champion 4 flushing system boasts the biggest valve and trapway in the industry. Independent maximum performance tests have proven that the system can remove 1000 grams of waste, which is 70% more waste than industry standards. Using just 1.6 GPF, this system provides a faster and quieter flush. The four-inch accelerator flush valve allows the water to enter the bowl faster than any other toilet, preventing dirt and streaking. The seat is not included. This product has a ten-year limited warranty. This high-cost toilet with a skirted bowl is available in cotton, colonial white and Sedona beige finishes. The bowl is protected inside and out by the patented SanaGloss ceramic glaze. This ionized barrier repels particles, bacteria and mildew, resulting in the use of fewer chemical cleaners and the retention of the glossy finish over time. A remote control or sensor can open the seat and lid of this toilet. This product sports the water saving Dual-Max flushing system, which is operated by an integrated control, allowing the user to choose between 0.9 and 1.6 GPF. The toilet has a programmable nightlight and a temperature controlled toilet seat, which has an automatic open and close function. There is a three-mode washlet cleansing system in the toilet seat. The flush system is automated and hands-free. It comes with a three-year limited warranty for residential use and one-year limited warranty for commercial use. This decorative toilet with a high-profile tank and chrome trip lever is in the middle price range. The proprietary SanaGloss glaze protects the elongated bowl and tank. This ionized glaze repels particles, bacteria and mildew, ensuring that the toilet retains its color and high gloss for years. Because it forms a protective barrier, it reduces the need for chemical cleaners. This unit is ADA compliant. The product sports double cyclone flushing which eliminates the need for holes under the rim. Instead, two nozzles force water into the bowl creating centrifugal force to ensure a sparkling bowl with a water-efficient 1.28 GPF. Eliminating holes in the rim makes the toilet more aesthetically pleasing and easier to clean. A SoftClose seat is included. SoftClose seats have been designed to prevent the lid from slamming. The lid and seat have slow-closing hinges, which bring them gently into place. The seat itself is ergonomically designed for maximum comfort and is molded from high-impact polypropylene, which can withstand chemical cleaners. The toilet has a one-year limited warranty. This toilet, which has a clean and modern design, is available in glossy white. The skirted trap has clean lines to make sanitation easier and lend a sleek finished look to the toilet. This toilet is higher than standard toilets lending maximum comfort. The seat has stainless steel hinges for durability. The toilet has a fully glazed siphon flush system, which is quiet and powerful. It is a dual-flush unit, which uses 1. or 1.6 GPF, depending on the selection. The toilet is WaterSense certified. The installation pack includes a pre-fitted toilet seat, ring, bolts and instructions. Designed for easy installation, the pack includes a wrench tool. There is a five-year limited warranty on porcelain parts and a one-year on flush system and seat. This low-profile, skirted toilet comes in at the top of the price range. It has an elongated bowl and is available in cotton white. The enamel bowl is protected by the patented SanaGloss glaze, which forms an ionized barrier repelling particles, bacteria and mildew. This finish requires less cleaning, reducing the need for harmful chemical cleaners. The Dual-Max flushing system uses 0.9 or 1.28 GPF. The temperature-controlled seat sports front and rear washing systems with adjustable pressure, which can be controlled remotely. The lid and seat can be opened by remote or automatically by the sensor. The flush is hands-free and automatic. There is an automated air deodorizer in the seat. It has an illuminated touch pad and two-user memory. The installation kit includes mounting and connection hardware. From standard, lower-cost toilets to toilets that sport all the bells and whistles but at a cost, there is a toilet design for every home and every budget.